Tomorrow being Thanksgiving I thought this would be an appropriate song to reflect over the year and count my blessings. Not that it takes Thanksgiving for me to count my blessings, but it is the holiday people recognize as the day of THANKS. This song came to mind Monday night when I woke up during the night and couldn't go back to sleep. I was whining around, complaining because I felt bad and couldn't sleep. I complained all day yesterday then I thought about the people that are REALLY sick. Sick with cancer or any other disease that makes them sick EVERY day. I thought about the people who are hungry as I was complaining that I wished I hadn't eaten so much. I thought about the homeless as I was wrapped up in my blanket trying to get warm. I just thought about people in general that are much less fortunate than what little I do have. 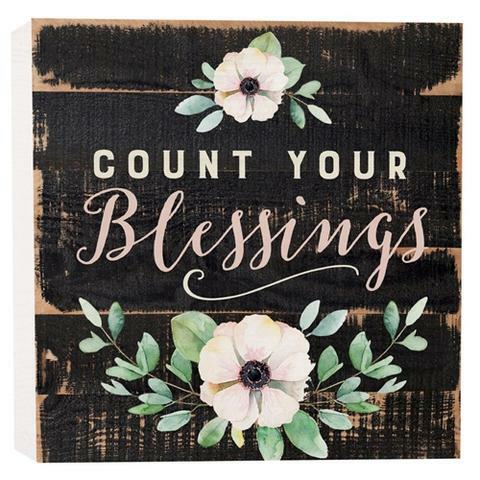 I remember singing this song as a kid but I'm sure I never stopped to think about counting my blessings. I mean as a kid who thinks about being thankful for the food you have, the roof over your head and the clothes on your back. That's what parents are for, right? So today, being Thanksgiving Eve I want to count my MANY blessings. I have more than enough to eat, a house to keep me warm, clothes way more than I need and a job that allows me to buy these things. I have a family and friends that I love, both my parents are still living, and a loving God that is the reason I'm able to write this blog with a heart of gratitude and thankfulness. Tomorrow my family will eat at my grandmother's house and there will be lots of food, catching up and laughter. I will miss my grandparents who aren't with us anymore and this year my Aunt Mary won't be there but we still have plenty to be thankful for. Thankful that my Aunts still have Thanksgiving for my dad's side of the family since my grandparents are gone, thankful that my mama is still able to cook turkey and dressing for us, thankful that my dad is able to come to Thanksgiving, thankful for my aunts and uncles that will be there and thankful for all the fun we will have just enjoying being together. My lesson today is so simple it doesn't take a rocket scientist to figure it out. Count your blessings, no matter how big or small. Count your blessings one by one. Count your blessings money can't buy. Count your blessings and give back if you can. I know I will!!!! I'm walking in a walk that cans of food is the entry fee to help with the hungry and before I have my own Thanksgiving dinner I'm serving at the local homeless shelter. No I don't do it for the praise or recognition, I do it because I can. I do it because I hope that for just one day, people can be hopeful and more importantly that they feel love on this Thanksgiving day. Love to all and Happy Thanksgiving!! !